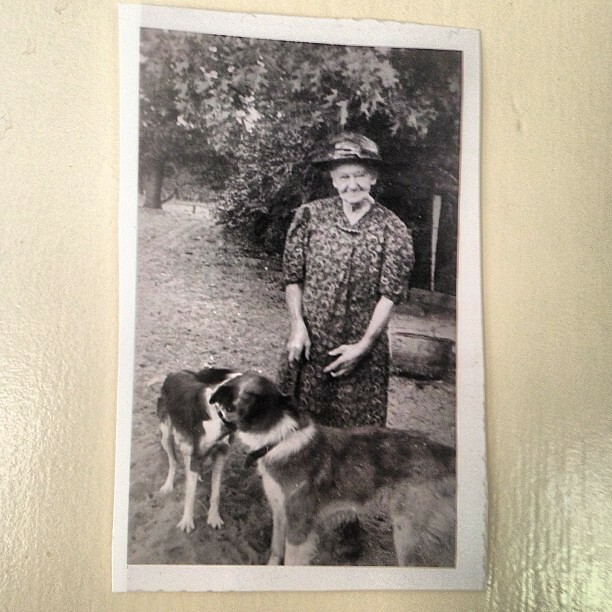 My great-great-grandmother Adrianna and her dogs. I love this photo, as it serves as a little reminder of all that we inherit from ancestors we’ve never met (in my case, a need to be constantly surrounded by dogs). Most people inherit their nose, their eye color, their height from their families. I inherited something more unusual: an obsession with dogs. Lurking somewhere within my paternal family’s genetic code, there is a line of DNA that predisposes us to be utterly enamored with canines. The trait is a powerful, surging, boundless, often irrational fixation with man’s best friend; it lends itself to the need to be with dogs at all times; a preference for dogs over people; an unblinking focus on dogs and their mannerisms; a desire to discuss dogs’ motives and interests over the motives and interests of human beings; a delight in the antics of the four-legged creatures and a general disavowal of the usefulness of the human race. My father’s mother, her mother, her mother’s mother, my father, his father, and I all share this trait. We proudly carry on the family lineage in our identities as Crazy Dog People. What traces of your long-gone relatives do you think you represent?